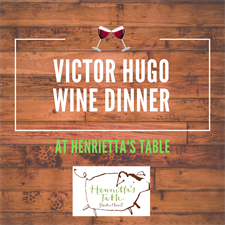 Join us at Henrietta’s Table in the heart of Harvard Square for a four-course supper with wine pairings from Victor Hugo Wines on Tuesday, April 9, 2019 at 6pm! We're happy to welcome back Victor Hugo Roberts, the wine maker/owner of Victor Hugo Winery, to Henrietta's Table. Learn from him about the latest developments at the vineyard and the varietals paired with each course, created by Chef Peter Davis. Don't miss out on this special private dining event! Tickets are $80 per person, inclusive of tax and gratuities.